Presenting the exclusive Game of Thrones Single Malts Scotch Whisky Collection. Bursting with unique character, each intriguing expression tells the story of an iconic Westeros House and the Night’s Watch. 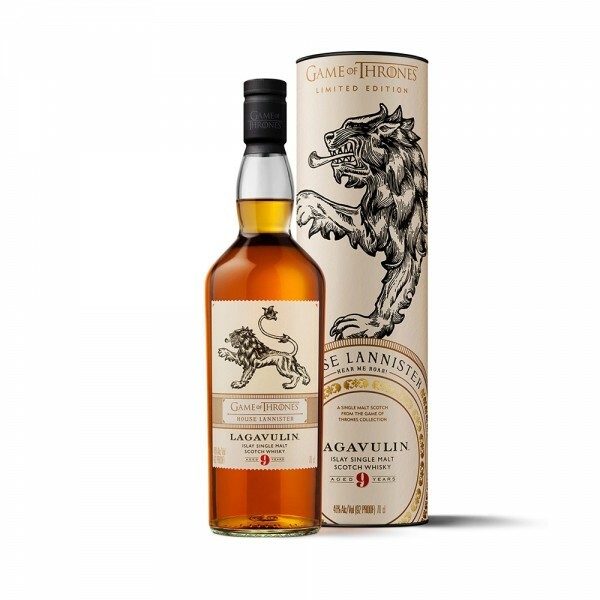 Lagavulin is inspired by the heritage and ferocity of House Lannister, as well as their longstanding mission to retain power over the Iron Throne and relentlessness in doing so. Classically Lagavulin (the region in Scotland in which this whisky was made), this roaring single malt is matured for nine years in ‘first fill’ ex-Bourbon casks, delivering a golden hue and a robust, smoky finish. Prepare yourself for a distinctively zesty nose and complex mouthfeel, composed of strong smoky hues and gleaming sweet vanilla and banana undertones. Rich and bold, just like the iconic House Lannister itself.